For many smart home devices, you will need to purchase a hub that connects them all in one place, and forwards that information to your smartphone. SmartThings works wonderfully with Google Assistant to keep your devices together, while still maintaining intuitive control over lights, thermostats, alarms, and more. 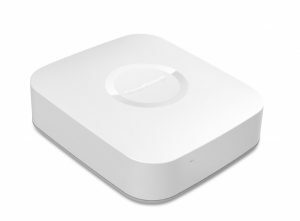 SmartThings can also string multiple commands at once, such as turning on lights, opening blinds, and then turning on the coffee machine. This handy hub also lets you connect hundreds of devices, all that can be controlled using Google Assistant’s voice control. Compatibility Rating: SmartThings is specifically designed to be the brain for your smart home, utilizing voice activation tools like Google Assistant and Amazon Alexa for maximum flexibility and customization. Once you have your device hub set up, you can begin connecting devices such as the Nest thermostat, a smart thermostat that can learn your routine and adjust the temperature automatically according to your preferences. The Nest is perfectly designed for smart homes, providing broad flexibility for smartphone control and voice activation. 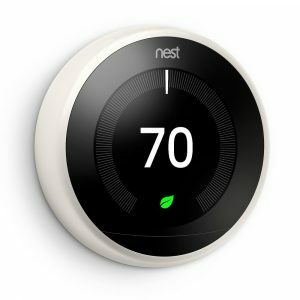 Commands such as “set temperature to 72” and “turn on air conditioning” through Google Assistant are simple functions for the Nest thermostat and ensure that you are always comfortable throughout the year. Compatibility Rating: Nest products respond very well to various voice commands through Google Assistant to control your home quickly and easily. Phillips has a great selection of plain and colored LED lights to suit every room in your home. These lights can then connect SmartThings device hub (via a bridge) or IFTTT, which in turn gives you control with Google Assistant. Change the color to one of 16 million different shades, dim the lights, or turn them off altogether with corresponding voice controls. The LED’s are energy efficient too, so you aren’t breaking the bank while creating a welcoming home environment. 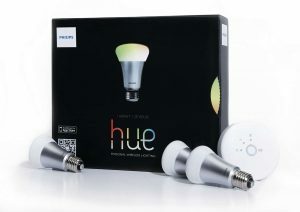 Compatibility Rating: Works well with Google Assistant, but Hue is currently not entirely supported by SmartThings without first having a bridge to support it. However, you can use IFTTT (If This Then That) to integrate Philips Hue with voice activation. There are hundreds of alarm systems out there, but for voice activation with Google Assistant, Scout has the perfect solution for you. Connecting to the hub and your smartphone gives you increased security. 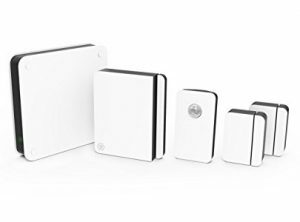 Receive alerts and notifications when Scout notices activity in your home, and choose what to do in the event of unauthorized access. Arming and disarming your alarm is a snap with voice commands that cut down on your morning routine while still ensuring that your home is safe and secure while you are away. Compatibility Rating: While Scout is compatible with Google Assistant, voice commands are limited to arming and disarming the system. Most functions of Scout are done directly through the smartphone via on-screen alerts. In conclusion Google Assistant supports a variety of useful smart home devices that you can control with your smart phone, adding the additional function of voice-recognition and voice activation to perform tasks that you would otherwise need to do manually. These devices utilize Google’s voice service through a central hub such as SmartThings or IFTTT, allowing you to remain focused on things that matter most to you.